At the age of 17, Livvy is the author of a bestselling trilogy for young adults. She has lots of money and a bright future until she rolls her car on a quiet stretch of road. When she comes to she finds herself in the basement of a house being held captive by a woman and her creepy, flute-playing daughter. The woman tells Livvy that she will be their prisoner until she apologizes for what she did. The trouble is that Livvy has no idea to what this woman is referring so she has no idea how to make her happy. Livvy's two captors are nasty and take delight in harming her but their actions seem benign when a male cousin shows up who makes it clear he has other plans for her. Livvy needs to find a way to escape, while she still can. Okay, so this is definitely a Misery-themed book. Livvy herself notes the comparison. So at first I was pretty disappointed with Bodeen for just copying that idea but fairly soon I got more absorbed in the story and forgot about that. While there are flashes of a conflicted conscience from the adult captor, she's still pretty mean and easy to dislike but, like Livvy, I found myself warming up to her in comparison to the other two people holding her. The story is pure action/thriller and if you take it for that without expecting a lot more, it's fun. There are two plot twists, one of which is extremely easy to spot from quite a distance. The other also becomes fairly obvious but I was still holding onto the hope that I was wrong about that one because I really wanted Livvy to be solely a victim in this situation. 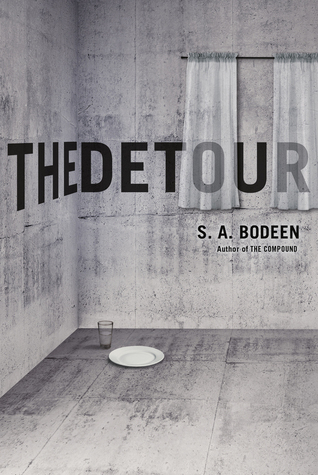 The Compound is one of my favorite YA books so I think I'm inclined to be generous with this title since I've been waiting for Bodeen to write something that is close to the quality of The Compound.